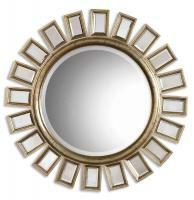 Brighten up any space with our Sunburst Wall Mirror. This unique round beveled mirror features a wood frame in a starburst design accented by several individual mirrors. The frame is finished in distressed silver leaf with light antiquing. Use over your fireplace mantle, buffet or vanity to brighten your room and add depth. What a fun accent for your entry, bathroom or bedroom! For more details visit www.cheapchicdecor.com.